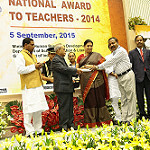 The Principal of the Vidyalaya, Sri Ramesan P.V., who has completed 25 years in Vivekananda Kendra Vidyalayas, been awarded the prestigious National Award for teachers 2014 by the Govt. of India for his meritorious service throughout his teaching career on 5 th Sept 2015. He was handed over the award by the Hon. President of India, Sri Pranab Mukherjee at Vigyan Bhawan, New Delhi in presence of Hon. Minister (HRD), Smt.Smriti Zubin Irani and other renowned dignitaries. It is worth mentioning that he was one of the two teachers who were selected for the National Award from the entire North East through CBSE.